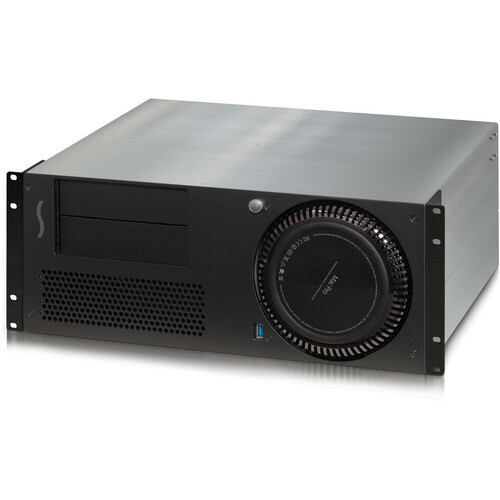 The xMac Pro Server PCIe 2.0 Thunderbolt 2 Expansion System from Sonnet is a 4U rackmount enclosure for the Mac Pro. It has three integrated PCIe 2.0 slots, 20 Gb/s Thunderbolt 2 technology, and expandability of Echo Express III-R Thunderbolt 2 expansion chassis for PCIe cards. Like the III-R, the xMac Pro Server provides space to mount additional equipment, such as storage expansion. To support a wide range of mobile racks, carts, and portable rack cases, the xMac Pro server is 16" deep. The xMac Pro Server securely holds the computer and installed cards, making your Mac Pro road-ready. The xMac Pro server supports three full-length PCIe cards. It has a universal 300W power supply and includes a 75W PCIe power connector for cards that require supplementary power, such as the Avid Pro Tools|HDX or the new RED ROCKET-X. The xMac Pro server is eco-friendly, as it automatically powers the PCIe expansion system on or off whenever the connected computer powers on or wakes, or powers off or sleeps, respectively. Note: Mac Pro, PCIe cards, and mobile rack device mounting kits are sold separately. Note:Mac Pro and PCIe cards are sold separately. Note: *Thunderbolt cable lock is compatible with Apple and Sonnet Thunderbolt cables. Not compatible with optical Thunderbolt cables. Box Dimensions (LxWxH) 23.0 x 20.0 x 9.0"
xMac Pro Server PCIe 2.0 Thunderbolt 2 Expansion System is rated 4.5 out of 5 by 4. Rated 4 out of 5 by Anonymous from xMac Pro Server allows for ease-of-use We installed an xMacPro Server TB2 Expansion Chassis in our machine room to make the MacPro rack-mountable.By putting the chassis in a rack, it made all connections to the MacPro so much easier. Rated 5 out of 5 by Steven from Best overall solution I'm in the middle of old Mac pro cheese grater models that are dying and whatever else Apple will grace us with in the near future.? This is a great solution to bridging the gap for a high end studio running Pci-e cards and numerous peripherals.? Great construction and easy to put together.? Would buy again. Rated 4 out of 5 by Anonymous from Heavy killer case Great all-in-one solution, sadly the drives expansion is sold separately and it costs too much for its purpose. Also, to my opinion the metal it's made of is too thick and therefore it's very heavy, but i guess it gains a more professional vibe cause of this.